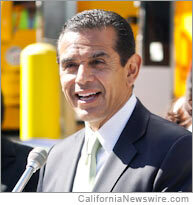 Last fall Mayor Villaraigosa, in partnership with Councilmembers Garcetti and Englander, called for a change to the tax structure for Los Angeles’ new auto dealers. The new auto dealer industry was identified as a large source of potential sales tax revenue currently being hindered by the LA business tax. “Today we eliminate a scheme that taxed car dealerships even when they lost money. We’re sending a message that we want these revenue-generating businesses to be in Los Angeles,” said Councilmember Eric Garcetti, who co-authored the ordinance. New auto dealers produce substantially more sales tax revenue for the City than they do business tax revenue. In 2011 alone, the City received about six times as much from sales tax revenue from new auto dealers than it did from their business tax revenue. LA has lost 95 dealerships in the last 25 years, but that trend is reversing course. Downtown LA’s “Auto Row” now has twice the number of dealerships than it did seven years ago. KIA of Downtown, the site of the press conference, is the second new auto dealer to open in LA in 18 months. KIA is expected to bring in about $55 million in sales per year, an amount that will bring over $400,000 in sales tax per year to the City’s general fund. KIA currently employs 50 people and is expected to hire another 15 for its expanding business. The passing of the new ordinance will help KIA and other dealerships open their doors to customers. According to the Greater Los Angeles New Car Dealers Association (GLANCDA), LA’s business tax has been an important factor for auto dealers looking to open new dealerships because surrounding cities like Glendale have no business tax. Reforming LA’s business tax is a core component of Mayor Villaraigosa’s five-step plan for creating jobs in Los Angeles. The five steps are: (1) reforming LA’s business tax, (2) reducing red tape, (3) partnering for economic growth, (4) improving LAX and the Port, and (5) building a 21st century transportation network.